Andy Schumann was born in 1960 and has lived in many different parts of the United States. He’s married to Diane, and has 4 children; Melissa, Tim, Michelle and Robert. Currently residing in the state of Wisconsin, he opened his studio full time in 1993 in Cedarburg, Wisconsin. Prior to opening the studio, he received a B.A. in Humanities and Education, with an Art Minor in 1989 at Concordia University in Mequon, WI. Over the past 18 years he’s received several awards and honors, including “Best of Show” at the Ward World Championship, The Greater Milwaukee Woodcarving Championship, and Ducks Unlimited Championship. After switching to bronze and pewter as his preferred medium, his awards and juried exhibitions went on to include the Miller Wildlife Biannual, the Wisconsin Designer Craft Council, Purchase Award at Marian University, and the Milwaukee Zoological art award for 10 years of service. In 2007, his prized bronze sculpture The Fisherman, was selected to become a part of the Milwaukee School of Engineering Grohmann Museum. 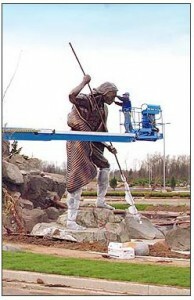 His public sculptures include The Fisherman at Rotary Park Port Washington, Wisconsin, Puffin Trio at the Milwaukee Public Zoo, and a 25-ft. tall Native American Spear Fisherman in Marysville, WA. In the spring of 2016 he installed a larger than life bronze sculpture of Martin Luther on the Campus of Concordia University Wisconsin.